Lately I feel swept away. Like I can’t find my footing and the current is pulling me all over the ocean. Like my throat keeps filling with water and I can’t quite breathe. I know God has hold of me and He won’t let me drown, that He’s spreading Himself out beneath me like a net, like a floor, like a foundation. I feel Him urging me deeper into Him. Urging me to dig down with my hands until my knuckles bleed, to stretch my toes all the way down into Him until I find true footing. Until I grip the bottom and the waves can threaten and shake me, but they won’t sweep me away. I didn’t grow up with an open heart. I was a fearful child who became a hardened young women with a tight wall around my heart. It wasn’t until I was about to adopt my son that my heart truly opened. God had been working on me for years, chipping away at the death grip I had around my emotions, my vulnerabilities. As I prepared to become a mother all the walls just broke away and I was reborn with a soft heart. Raising Rahul was harrowing, and God kept me strong and tough skinned. But the new, soft heart He created within me was a wonder to me. I couldn’t believe all that I was feeling. I couldn’t believe how much I loved this child. I felt like I was truly living life for the first time. And I loved mothering so much that I began to open my arms and my heart to other people around me. I cultivated a beautiful group of friends and have learned over and over again how to open my heart to the people God has put in my life. As a hairdresser I have the opportunity to connect with people on a deeply personal level, and I truly love my clients. I love learning about them and listening to their stories, their experiences. I love that they trust me and listen to my stories, too. But one of the consequences of living life with an open heart is that it gets broken over and over again. I never want to go back to living with closed-off emotions, but sometimes the heartbreak is overwhelming. And lately it feels like wave after wave of pain. Oceans of pain. As I hold on to people I love while they are drowning in depression I feel myself being pulled under, too. As I hear them pour out their hearts in grief and remorse, I feel those waves knocking me around. As I give my heart to people who don’t want it, I feel myself sinking deep below the surface. Oceans of unrequited love, behind and afore, overwhelm and horrify me. Waves of humiliation break over me as I give my heart where it’s not wanted. I’m stretching myself as wide as I can, reaching out my arms, but they can’t steady me. You call me out upon the waters, the great unknown, where feet may fail. And there I find you in the mystery. When I woke up one morning 7 years ago, I knew something was wrong. My neck ached, but in a different way than I had ever felt before. By the time I stepped out of the shower, my pain was gone, but the next morning it returned. Each day it stayed a little longer and strangely, it moved around my body. One day my neck would ache, the next day it was my left knee. Then the next day the bottom of my foot, followed my my right shoulder blade. I have a very high pain tolerance, so it didn’t slow me down at all, but it was beginning to worry me. After a few weeks the pain was widespread and never dulled. I would wake up in the middle of the night because both my arms were inflamed with pain. I would feel vomit rise to my throat as I worked, the pain washing over me in waves that made me nauseous and breathless. I thought about my life: I’m a single mom who only sleeps a few hours a night as it is. Losing any of that sleep could break me. And I’m a hairdresser. Without the use of my hands I can’t make a living. I worried that the extreme stress of raising my special needs son on my own had created a crisis in my body that I wouldn’t be able to outrun. I went to see my doctor, an amazing woman who really listens to me. She tested me for all the suspected culprits of this type of pain, but found nothing. She continued to think about my case and would check in with me every few days, letting me know she hadn’t given up on me and was committed to figuring out what was wrong. One day after driving for a few hours I looked down at my ankles and they were swollen to twice their size. I stopped by my doctor’s office and drew her a picture of what my ankles looked like and the next day she called me with her diagnosis. After looking at my picture she had me tested for sarcoidosis and the test was positive. It’s an auto-immune disease that can be deadly, but can also go away in a short time. I went to 3 or 4 rheumatologists in the next year to seek treatment, with varied results. One told me I was perfectly healthy. “Good news!” she said. “I’ve tested you for several things and there’s nothing wrong with you!” Another sent me away with a prescription for steroids, which did wonders for my pain and enabled me to keep working and sleep through the night. And one walked with me through the illness, teaching me how to step down slowly off the steroids, advising me that one auto-immune disease can easily morph into another. (He was sure I was developing Lupus). After several years I had still not been able to ween myself from the steroids and I was gaining a lot of weight. My face had the tell-tale moon shape that prednisone gives you and my body was lumpy and swollen. I still had pain–enough that exercise was excruciating–but could manage to sleep and work. I felt like I was always bracing myself. I was afraid to turn my head too fast or run or put too much weight on my ankles or wrists. I felt fragile and puffy and tentative. Two years ago I lost my health insurance for good and at the same time I began to notice the tell-tale butterfly rash on my face that indicates Lupus. I started getting sores around my hairline and on my wrists and when I Googled them, I saw they were also symptoms of Lupus. I knew I had to do something about my health and I decided to reach out to a client of mine who is an acupuncturist. I have known him and his family for many years and I trusted his expertise. We decided to barter acupuncture treatment for haircuts and I resolved that even though I knew very little about Chinese medicine, I would do whatever he advised me and I would trust him. I faithfully followed his dietary suggestions and saw him every few weeks for 3 months and I noticed that I was beginning to really feel better. I felt like energy was moving through my body again, I wasn’t always bracing for injury. My daily pain level had been cut in half. We decided I would try again to slowly step down off my steroids, and in another 3 months I was feeling even better. My acupuncture treatments were really painful and I had no idea what he was talking about when he described the energy channels and yin and yang and all the other Chinese medicine stuff he tried so carefully to explain to me. I really didn’t care. It seemed to be working, so I was like, I’ll do whatever you tell me to do! And if you need to twist that hot needle around in my leg until I scream in pain, carry on! As long as I keep feeling better, do whatever you need to do! Then last December, a year ago, he suggested that I try intermittent fasting. I had no idea that it would do me any good, but he advised me to drink only water or plain tea all day, except for 3 hours in the afternoon, when I could eat and drink whatever I wanted. For 3 days. I hated it, but I did it. And for the first two days I felt horrible. Then halfway through the third day I began to feel better than I had in years! It was amazing. It really felt like my body was healing itself, becoming whole again. Energy was flowing through me and I felt very alive. I began to make it a regular practice to fast intermittently several days a week, and I was quickly able to completely stop taking prednisone. I dropped dozens of pounds and began to practice yoga again. I would stare at myself in the mirror in yoga class and couldn’t believe that I could bend and stretch and stand on one foot–all my weight on one ankle–with no pain. My body got stronger and leaner. By the summer I added running to my routine, something I hadn’t been able to do in years. When people noticed my weight loss, they would ask me my secret. Was I dieting? Oh, I was fasting? Maybe they should try that, too! Acupuncture? Did that help you lose weight? I had no idea. I really could care less about my weight. How could I explain the gratitude and the relief I felt at not being in pain all the time? At not constantly worrying that I would only get worse and worse, compounding illnesses until my body wore away? I have no idea how to help anyone lose weight. I have no idea how to explain why acupuncture and fasting have worked for me. I don’t know how to help anyone heal. I don’t understand why it worked for me. But I do know one thing: I have never been so grateful for this amazing, energy-filled, yoga-praciticing, regenerating, shrinking body of mine! I don’t know why I healed, but I know that I did. And I am beyond grateful for what I consider a second chance at life. I feel blessed and I feel lucky. If you ask me to explain sarcoidosis or fasting or acupuncture I can’t. If you ask me why I healed when so many others only fade away, I definitely can’t. I know it’s not because I am more faithful or more good or more blessed that I have found healing and renewal. It’s not because I found the best acupuncturist in the world or because fasting is a cure-all. I can’t explain what has happened to me, I can only tell you how I feel. When I work a 14-hour day and have no pain in my hands or cramping in my feet or swelling in my ankles if feels amazing! When I practice yoga and watch my body bend and stretch and strengthen I can barely contain my surprise and awe! As I run around my neighborhood in the middle of the night or through the woods in the middle of the day I literally hold my hands up in the air in praise to God because I can’t believe how alive I feel. I appreciate my health every day. I do everything I can think of to maintain it and celebrate it. As I pray for my friends who have lost their loved ones to terrible disease and for my friends who’s bodies are wasting away from illness, I also thank God for the gift of health. I didn’t earn it and don’t deserve it, but I will appreciate it every single pain-free, healthy day. George Bailey is my hero. He is my favorite fictional character (followed by Jean Valjean and Lorelei Gilmore). Every time I watch It’s a Wonderful Life I discover a new part of his story that resonates with mine. When I created this blog, many years ago, I had just adopted my son and I was looking for some medium where I could tell my story. I was learning so much and I wanted to share my experiences and reach out for support at the same time. When I was trying to encapsulate what the theme of my life was, I kept thinking of George Bailey. The journey I had taken to motherhood was not what I planned at all. I had a completely different life envisioned for myself! But God determined my steps and gave me things I didn’t even know I wanted or needed. I was full of gratitude for my unexpectedly wonderful life! George Bailey is a man who knows what he wants from a young age: he wants to travel and explore and see all the things he reads about in magazines. But each time he is about to set off on a journey, a crisis occurs that presents him with a choice. Each time he can either choose to follow his heart and go traveling or he can stay home and take care of his family and his community in some way. He always chooses the unselfish path, but he pays the price by becoming bitter. When he finally becomes so discouraged that he wants to die–when he sees no other way out than to kill himself–an angel intervenes and shows him the magnitude of all the difficult choices he made in his life. He gets to see what the world would be like if he had never existed. And it’s pretty bleak. It turns out that even though he felt like his life was small, he had an enormous impact on his community. Seeing this helps him to be grateful for the life he has and stop yearning for the one he thought he wanted. He understands that he has lived exactly the life that God wanted him to live, and it’s actually been pretty wonderful. I knew from the time I was very young that I wanted to leave my hometown, move to NYC and become a Broadway actress. I had a clear path to those goals and no one ever stood in my way. I moved to NYC when I was 17 to go to NYU and found a lot of success in the musical theater department. My senior year I held the lead role in both the school opera and the musical and by the time I graduated I had sung for top casting directors in the city and had an agent who was submitting me for Broadway productions. I started getting job offers in theater, and I began to be overwhelmed by the choices I was being asked to make. Each job took me away from home for months and over the years I turned down work because the jobs were too small to warrant leaving home, or they didn’t pay enough. Twice I turned down good jobs to stay in NYC and be the Maid of Honor at friends’ weddings. I didn’t know how to choose work over friends or responsibilities and after a few years I had turned down more jobs than I had accepted. Eventually, the job offers dwindled and I pursued a different career altogether. God opened the door so wide to my hairdressing career that I ran through it and have never looked back. I have found success and happiness and every corner of the business. I had never seriously considered doing any other kind of work than performing and was so surprised and grateful to love my work and have success come so easily to me. I had always intended to get married. My parents got married when they were 22 years old and that seemed like a good plan to me. I did have a serious boyfriend at that age, but at just the time when we would probably have begun thinking about getting married he went through a very difficult crisis and I saw clearly that I needed to give him space. I couldn’t explain to him why I was breaking up with him, but I was 100% sure it was what I was supposed to do, not for my sake, but for his. And he did recover and flourish. And move on without me. The same thing happened again and again with other men until I began to realize that maybe I was supposed to be single. I didn’t stop dating, but I did start to really appreciate all the awesome things about being single. I had intended to marry, but I loved my independence more than I loved any of those men. (To be honest, there has been one man I really wanted to marry. But that’s a whole other story…) Looking back on my life now I can see that God knew exactly what would be make me really happy and fulfilled. He created me and He knew how much I would love adopting and raising a child on my own, owning my own home, owning and running my own business. I have had a really wonderful life and I’m grateful that God wrote a special story just for me. I know He is still writing my story and believe me, He constantly surprises me. Becoming a mother was never a dream of mine. Until it was. And then I adopted Rahul! And being his mom has been the most unexpected, wonderful blessing of my life. Who knew I would love mothering so much? I dream of adopting 10 more children and who knows? Maybe God has that in store for me as well. Some people may watch It’s a Wonderful Life and wonder why someone would make the choices George Bailey did. It might seem like he chose his own failures by not following his dreams. He always had them in his reach, but he constantly makes decisions that he knows are the right thing to do, but probably couldn’t explain them to other people. I know what it’s like to be a disappointment to people who shared your big dreams. I know what’s it’s like to be so boxed in and lost that you want to give up your life. But I also know what it’s like to find contentment by following unexpected paths and to be fueled my a greater gratitude than you even knew existed. Basically, I’ve given up trying to write my own story. God has such better ones written for me! 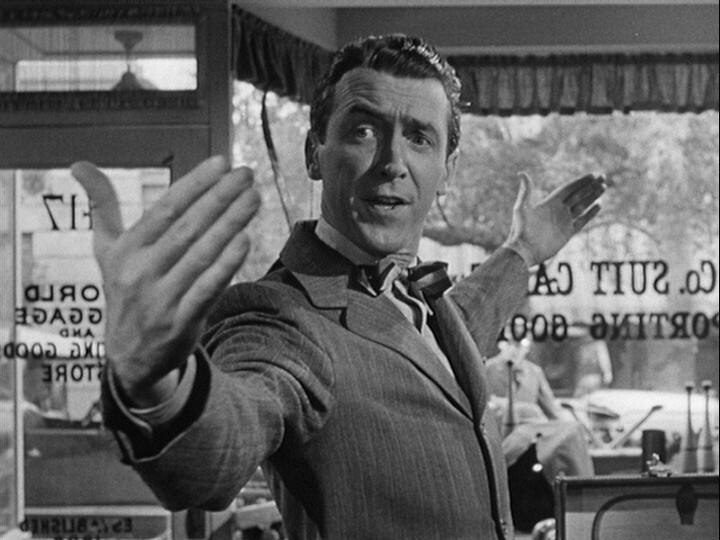 I’ll just document what I learn along the way, through this wonderful, George Bailey life.